The tree grew on the edge of the huge rock cliff. I didn't know which was holding the other up, but it looked as if one fell, the other would also come crashing down. It is not easy to describe life in the mountains to those who have never lived there. Our back yard really was the mountain. It was cleared for many feet upward and had enough level areas so that we had space for a barbeque pit, my dad's workshop which had a wood storage area attached, and gardens for Mom's flowers. Higher up in the back yard were rock cliffs, flat on top and great to perch upon and enjoy the view. Further up where our cleared back yard ended and the line of trees began, there was a path that went uphill following the stream to its source much higher up on the mountain. I was never afraid of going up the mountain, because I knew if I followed that stream it would lead me home again. When I wanted to get truly away from it all, I had a favorite place to go, but it took an hour or so to get there. I could not decide which had been there first, the huge old tree, or the giant rock cliff that it seemed to be growing from. I could approach it from the top and rest against the tree, if I wanted to. If I approached from below, I would be in my secret place. You see, the old tree and the rock were bound together by roots and time, and one could not move without the other. They had a perfect union, and they provided the only secret place I ever had. On top, I could sit in the warm sun and picnic, because I always brought a snack. Beneath, I crept back into the cradle that the roots and the rock provided. It was a big enough opening that I could sit upright, and could not be seen from either side. My secret place overlooked the gurgling stream of cold mountain water. I spent untold hours there during the warm months, and I contemplated the state of my little world, with never a fear that the tree or the rocky cliff would ever let go, of each other or of me. The tree was a chestnut oak and I had been told it was hundreds of years old. It really wasn't tremendously large, but it was just settled, you know, like a very comfortable old grandmother, rooted to her spot in life. It was secure, knowing that as long as it had a grip on that rock, it would be safe. I felt the same way when I leaned back in the cradle, made where the tree and the rock merged. Its leaves are oblong in shape with a toothed edge and are about 5 or 6 inches long and an inch and a half wide. They are dark yellow green in color, and they become orange to yellow in autumn. They do not grow in pairs but are arranged alternately along the branch. The flowers are borne on catkins or are in little groups on spikes near the base of the leaves. 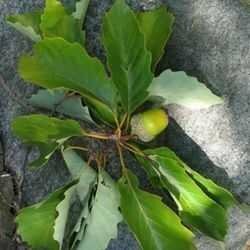 The fruit, acorns, are shiny dark brown, oval and up to an inch and a half long with a fine cap that covers about 1/3 of its length. The scales are tight and fused together. 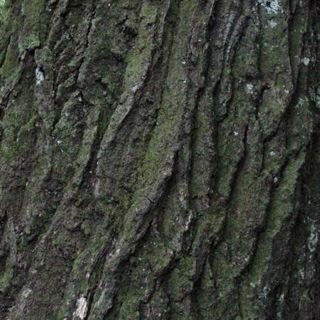 In older trees the bark is rough, dark brown to black, with irregular and deep furrows. The crown can be oval or pyramid shaped depending on where it grows, and becomes more rounded with age. The crown spread is about equal to its height, again depending on its environment. The acorns often shed their caps as they fall from the trees, leaving the edible fruit for the wildlife to enjoy. They are favored by squirrels, bears, deer and other wildlife. Its wood is used for furniture, cabinet making, interior finishes, fence posts and for fuel, and its use is highly valued. The acorns, supposedly sweetish, are also edible to man. More years ago than I can remember our Native American ancestors ground up the seed into a powder which was used in breads. Roasted seeds were often a coffee substitute, b ut it is so high in tannin it has a very bitter taste and I doubt that anyone uses it now. They also used the acorn cups for buttons to adorn clothing and in some decorative fashions. 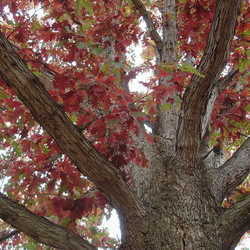 The bark of the tree is a commercial source for tannin, and a red dye is also attained from its bark. 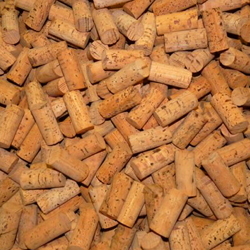 The bark itself, when it reaches maturity, is massively ridged and the thickest of any eastern North American oak. 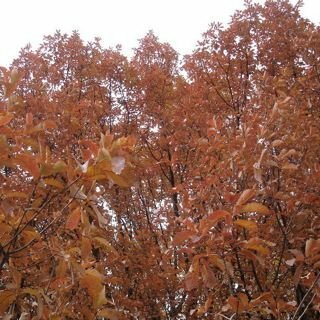 The chestnut oak has often been confused with the swamp chestnut oak, but the latter's bark is not as thick, is paler ash gray, and scaly. 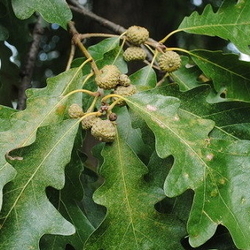 Another distinguishing characteristic is that if it grows on a ridge, it is a chestnut oak, and if it grows in wet bottomlands, it is probably the more massive swamp chestnut oak. Even with those characteristics, it is sometimes difficult to tell them apart. So my old chestnut oak and the cliff rock held me safe as they held each other there in the mountains. I read a lot when I was young, still do, actually, and when I was safe in my rocky cradle, I remember reading aloud for hours from one book or another. The titles and authors changed over the years, as I did, but the rock and the tree seemed to never change. A tree's life span is as long as its roots can support it, or until it can no longer grow leaves or needles. Sooner or later most trees will be weakened by erosion or time, wind, rain, lightning, fire or even man. Most oak trees can live for four or five hundred years, depending on their environment. Those mountains and their trees are still in my family, and have been left to grow and age with no disturbances. Trees, like people, have a natural life cycle. They grow up, grow old, and die, influenced by nature and by man. I like to think my tree and rock are still there, welded together in mutual harmony as they have been for years. Some days I'd like to be there with them. 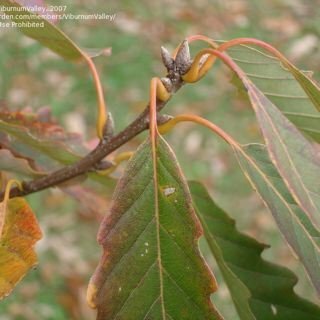 Photo Credits: From Plant Files: chestnut oak bud and fall tree: ViburnumValley; bark: Floridian. The thumbnail and the green acorn are from Wikipedia's Public Domain.